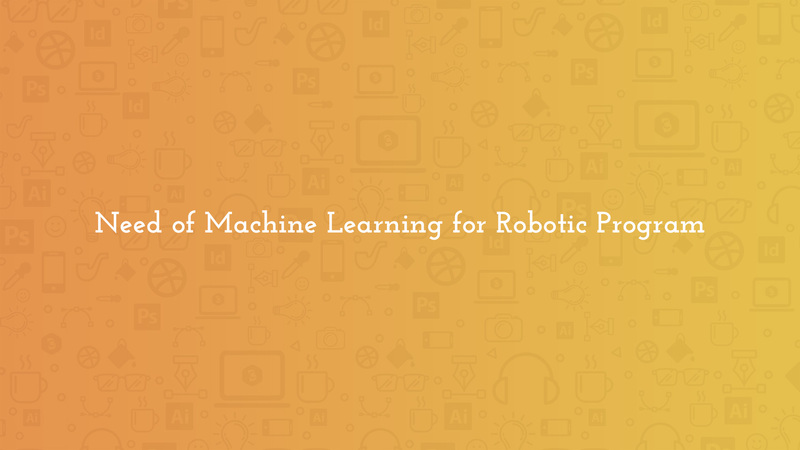 In this article, we will discuss “Need of Machine Learning for Robotic Program“. The term Robotics is strictly concerned with robots. A robot is a programmable digital machine that renders an array of tasks at a faster rate in some particular method. Many software and digital machine experts are not agreed yet what exactly composed a robot. Only, we can consider that it has a great physical appearance with programming features and autonomous functionalities. Some regular usable robots are given below. From the above robots, the automobile assembly robot and surgery robot are openly programmed to perform a function and they don’t have learning capacity. So these are not considered as AI-based robots. Industrial robots are made for some repetitive tasks without any analysis or thinking. The machine algorithm helps robot learn or get trained to perform some particular hardcoded functions. This ML algorithm makes way for AI and hence, self-learning and decision making will be easier. ML has a crucial impact on robotic technologies for present and future development purposes. Though by no means inclusive, the purpose of the summary is to give readers an experience for the types of ML applications that appear in robotics and stimulate the desire for further research in these and other areas. The camera devices of Robots accomplish the visualization tasks and the robotic programs record and process the physical data. Hence, the Robot vision is also known as machine vision, which is used for the need of automatic inspection systems and robot supervision. Generally, robot vision helps in the identification and detection of objects with unsupervised learning, such as building systems ability to discover and assessing any disputes or faults in silicon wafers through neural networks or robot. The extrasensory devices such as radar, ultrasound, and lidar, etc., drive the implementation of 360-degree visual systems for drones and automatic vehicles, etc. Therefore, here the robotic program has a great use of detecting many secret things and invisible things like enemies, threatening animals and harmful things. Now these days, automated drones help to destroy enemies without losing any human lives of the attackers. Self-supervised Ml algorithm enables robots to produce their own training instances in order to maximize performance. This learning includes prior training and nearest 3D data captured data to interpret the long-range sensor data. For instance, it locates and rejects objects such as snow and dust. Also, it identifies vegetables and blockage in irregular terrain; and in 3D-view analysis and vehicle modeling purpose. Watch-Bot is one nice robot, made by researchers from Stanford and Cornell. It includes a 3D sensor, a camera, laser pointer and laptop to find out ‘human activity’ through probabilistic methods. It’s laser pointer targets the object for reminder purpose. For instance, the water tank is filled up, the milk that was taken out of the fridge. Initially, the bot was reminding the human partially about the status, but after many research and developments, it learns everything through videos. This program is also known as Robowatch. Simulation learning is also similar to observational learning, which is a deed exhibit by toddlers and infants. This learning also acts as an umbrella for reinforcement machine learning, which can bring more rewards for best performance. The probabilistic and Bayesian models are general features of this machine learning tactic. Observational learning becomes an essential part of field robotic programs, in which mobility of robots outside a factory setting in fields such as agriculture, construction, military, security, and search and rescue, etc. to apply manual robotic solutions. In fact, Forward and inverse programs are set for the robots to have a better mobility on the road. An assistive robot can record and process sensory data, and perform further actions accordingly. This action benefits senior citizens and disables persons with helpful tools. In the hospital, the robot devices work for scanning and reporting. Multi-agent learning includes coordination between multiple machine learning robots and they work as agents for a game or any outdoor programs. Now these days, the researchers work together to organize the best performance of the Machine learning based robots. Most of the machines learning developers try to emphasize the output of robots and the people get huge benefits from the robots and the investment in manpower is being reduced.